There are so many different interpretations of this work, and in each one the details of the story change but the idea remains the same, mankind doesn’t matter. We are little more than insignificant specks in the eyes of creatures so much larger than ourselves. This is the idea of pretty much everything that came from the troubled mind of H.P. Lovecraft. It wasn’t that long ago that I ran across the video I have attached to this article (check it out, it is well worth a watch and it is less than 8 minutes). This one was put out by CGBros and a pretty big team of student animators and artists. The way the story unfolds is similar but not quite the same as other versions. Which brings me to the next version of the story that I recently read. I happened to run across a graphic novel adaptation that gave the story a new perspective (Sterling 2010). This version was adapted and illustrated by I.N.J. 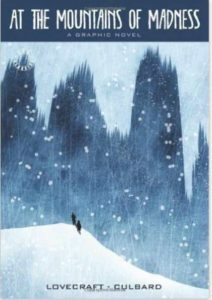 Culbard. And there is a reason why I pair these two versions together. Though the stories play out a bit different, they share a similar visual style. Of course, I hadn’t noticed that at first. I mean seriously, there are a number of adaptations of the story to be found on youtube. And of course, you have to watch them all. So this animated version of the story showed up in my Facebook newsfeed and I spent the time with it. And then a couple weeks later I ran across the graphic novel at the library and didn’t think of the video again. But then we have to take into consideration the lag that follows anything online. So then I have the two of them essentially side by side for comparison. You know that feeling you get when you see the movie and read the book and they don’t quite mesh up? For me it has always been on a case by case basis in how I feel about the disconnection. For some things it doesn’t bother me and for others I will not enjoy one or the other of the different forms. But when it came to comics that wasn’t always the case. For the longest time it was near impossible to make comics into visual adaptations (movies or television). The technology just wasn’t up to the task. Things have changed with CGI and all that. We are able to see the stories in a way that rivals what we have seen in the comics. (Yes, I know not all CGI is good, but it isn’t all bad either. Just as anything it is a spice that can add flavor to the story and enhance the goodness to come or can be overdone and destroy the whole thing. It’s all about balance). Anyway, part of the realization I had was the comic book approach to stories. The stories can be told in new and different ways and still be enjoyable (for the most part. And there are still a number of them that annoy me but those are based on reasons outside of story telling and something for another time). Although, I think I might have said something along these lines in the past too. Basically, our perceptions are all going to be different so we won’t all see exactly the same story no matter how we experience it. The cool thing is having the opportunity to explore stories in different outlets. We will all find something new and different to enhance the general story that is working its way through our subconscious. And so now I think I might have gotten completely lost on the direction of the original premise of this article. Which fits in perfectly with the spirit of the work of Lovecraft as a whole. We are talking about beings so much bigger than ourselves that we touch on madness and beyond in our efforts to try and understand them. This is fear beyond the unknown, a madness of the unknowable. With that said, read the comic, watch the video, heck take some time and read the story. No matter the form you pick it up in, it has something unique and fun to offer.